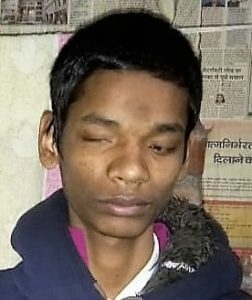 17 year old Prabhat Singh from Auraiya, Uttar Pradesh is blind by birth. His father is a farmer and his mother a home maker. He is the youngest among the six siblings and the only visually impaired person in the family. Coming from a low-income family, Prabhat had very little support to live a life with blindness. He was sent to a school for the blind in New Delhi which provided education, accommodation and food free of cost. Prabhat studied there for a few years but he failed in Class 8. The lack of emotional and financial support from his immediate family left him demotivated and depressed. His education came to a halt and he sat idle at home for the next three years. But Prabhat desired to do more in life. He subscribed to a monthly braille magazine which he’d learnt about while in school. Going through one of the magazine issues, he chanced upon the Eyeway toll-free number and decided to call the helpline. Prabhat was very shy when he first dialled up the Eyeway toll-free number and found it difficult to frame his questions. After a positive and motivating conversation with the counselor, he decided to enrol at the Janta Rehabilitation Centre for the Visually Handicapped where he underwent a six months training which included reading and writing Braille, candle making, usage of smart cane etc. After completing his training, the counselor advised him to prepare for CBSE’s Class X through open schooling. To help him with accessible study material, the counselor asked Prabhat to get in touch with either National Association for the Blind (NAB) or National Institute for the Visually Impaired (NIVH), Dehradun. But apart from completing his 10th, Prabhat was curious to know of training opportunities that would enable him to earn a living. He no longer wanted to be dependent on his family and so the counselor suggested him to join a vocational training program offered at the Tata Agricultural and Rural Training Centre for the Blind (TACEB), Gujarat which educates blind people in agriculture, horticulture and animal husbandry with the objective of rehabilitating them back into the mainstream. Following our counsel, Prabhat has joined Class 10 and will simultaneously pursue the training program at TACEB. He was extremely happy to have contacted the Eyeway Helpdesk and to found new goals for himself.